Now a days VPN is a good service package that users love to use on their devices that are connected to internet. Many people use a VPN service just to be anonymous on the internet despite knowing the fact how their identity can be misused. After the PRISM controversy in the US, people are scared or concern about their privacy over the web. Even I agree with the tagline "Security & Privacy are not optional" on the Mozilla Firefox Start Page. 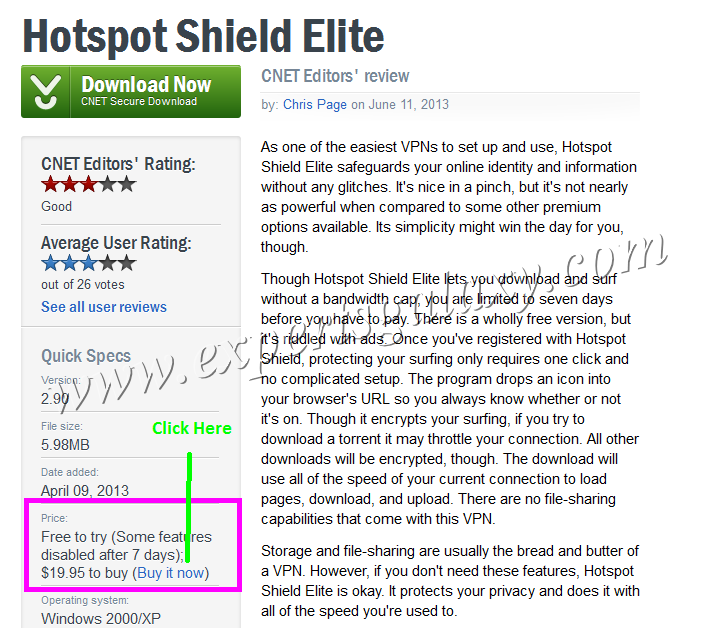 Hotspot shield is considered as one of the best free VPN service among so many available there. 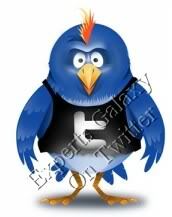 My friend Bill has reviewed the software many times on his blog. I have tried the free version twice but it did not work as per my expectation so I uninstalled it after few hours. 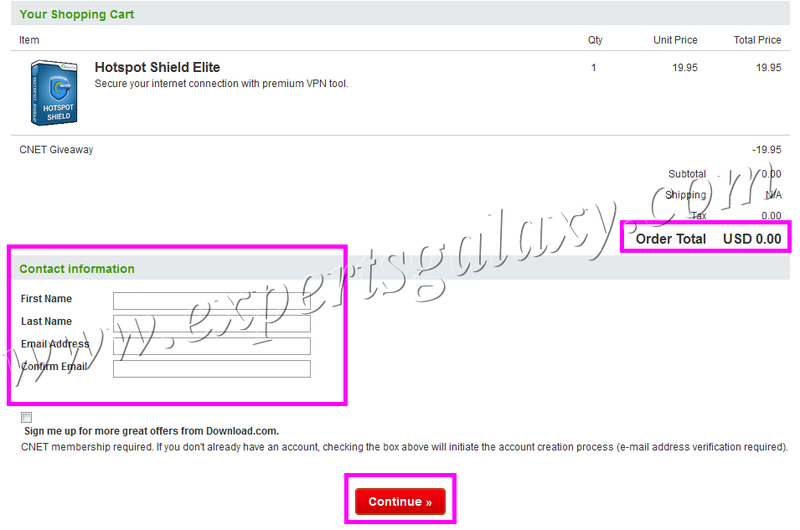 I have also tried CyberGhost under a 1 year premium VPN giveaway that I also shared here with the readers of this blog. However at the end of my promo subscription when I was about to buy their product, I started facing some issues and then dropped the idea of purchasing it. 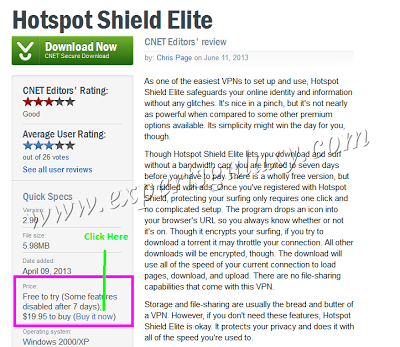 There are so many lovers of the free Hotspot Shield VPN service and I am sure that many EG`s readers also love it. Here is a good news for all those lovers that they can get the elite version of the software free for 6 months ( Intotal 50,000 free codes would be given ) via CNET. I got an email from CNET as the newsletter subscription with the link of the post informing about the giveaway and thought of sharing the giveaway with all including the procedure to get the free VPN as it took me sometime (around 15 minutes to find out the way to get it). 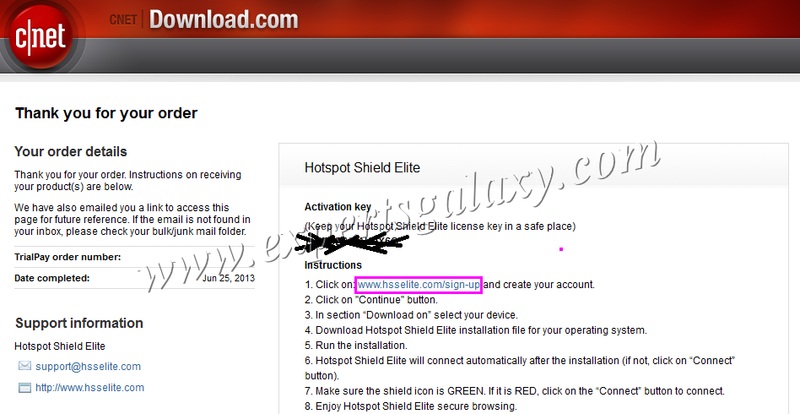 At the end, you would see the order details with the Activation key. Please click on the link as shown below to signup for an account which is required to use the Hotspot Shield Elite Version. 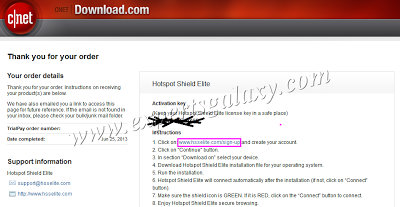 There are many other VPN softwares available few are free and many others are paid. If you know any other good, reliable, free or paid VPN service do let us know so that we can share the same with all of our readers.